"The election of 1980 did more than break the Democrats' control of the White House and Congress. It also shattered some important assumptions about the character of our voting coalitions and the condition of our political parties. It opened some possibilities for the remainder of the century that had not been there before." 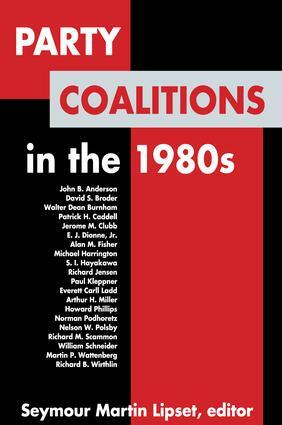 These reflections by David S. Broder in the introduction to Party Coalitions in the 1980s are echoed in the essays of the twenty-one scholars, party leaders, and candidates in the volume. This book presents a detailed and lively discussion of the past history, present significance, and future implications of coalitions in the American two-party political system. Patrick H. Caddell observed that "Reagan has skillfully huddled a variety of conservative program and issue initiatives under the umbrella of'economic revitalization.'" In that vein, Richard B. Wirthlin argued that "the 1980 presidential election should be viewed as a major … opportunity to redraft the policy agenda of this country." Realizing that change is one of the few constants in politics, Lipset and his colleagues set forth strategies and guideposts for Republicans and Democrats who sought to build winning coalitions for the elections of the 1980s.